Donald Trump hosting Saturday Night Live Nov. 7; someday the sun will engulf the Earth. 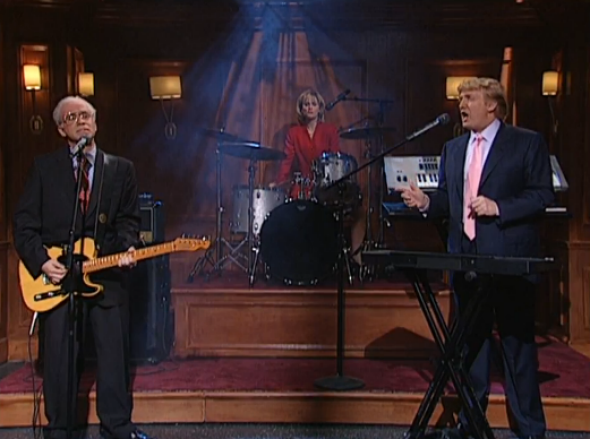 Donald Trump with Fred Armisen and Amy Poehler in a skit from his April 3, 2004, Saturday Night Live appearance. Republican presidential candidate Donald Trump will host Saturday Night Live on Nov. 7, NBC announced on Tuesday. Also, at some point an estimated 7.5 billion years from now, the sun will expand to engulf the Earth in fire. The controversial real-estate tycoon will be making his first appearance hosting the show since April 3, 2004, at which time he was starring in the NBC reality series The Apprentice. Because of the sun’s steadily increasing luminosity, all life on Earth will likely be dead—and all of the globe’s oceans evaporated—long, long before the planet itself is consumed in flame. Though Trump’s once-commanding lead in Republican presidential primary has shrunk in recent weeks, he still holds a 5-point lead on Ben Carson in RealClearPolitics’ running average of national polls. From space dust we came, and to space dust we will return—you, me, and everyone you’ve ever known, nothing but tiny particles bouncing alongside each other throughout the universe, the affairs of men erased and forgotten aeons before.